The S420 series was designed as a direct replacement for existing Strantrol pH and ORP probes. Constructed of durable CPVC, S420 probes offer improved chemical resistance. Additionally, Sensorex uses a higher volume of its proprietary polymer sensor reference gel for longer service life. The advanced sensor technology delivers accurate measurement over a range of 0-14 pH or -1000–1000mV for ORP. The probes are suited to a variety of applications with a temperature range of 0-50°C and a pressure maximum of 100psig. The threaded ½” NPT connection enables easy in line installation or use with existing Strantrol flow cells without modification. Advanced signal shielding reduces noise for more accurate communication with process control systems. 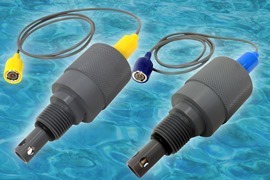 Both the pH and ORP probes are available with the option of 30 inch or 10 foot cable lengths for quick integration into existing systems.